Anniversary weekend road trip reading! Jeremy and I like to read books together when we have the chance. That hasn’t happened much in the last two years, because it is a little awkward to read aloud on the minibus or tramvay. (We do however share headphones and listen to comedy radio, and that’s not much better!) Anyway, back to the point of this post. We were road-tripping for our anniversary trip, and we chose this book together to read while we were away. We have read two other books by Charles Martin together before, and we really loved them, so we decided to check out another of his books. So, without further ado, a synopsis and my thoughts . . . 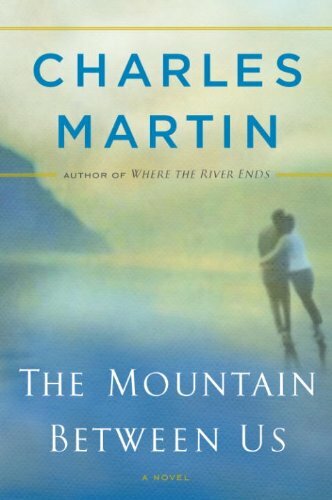 The Mountain Between Us: A Novel by Charles Martin is the story of two people in the middle of their busy lives, one about to get married, one in the middle of a doctoral career, who are trying to beat a storm in the west to make it back to the east coast without ruining any of their plans (including surgeries and a wedding rehearsal). When all of the flights from Salt Lake City are grounded, they get into a charter plane together hoping to make it to Denver before the storm does. But, they don’t make it to Denver. Instead, they crash land in the middle of uninhabited, vehicle-forbidden wilderness with only the supplies from the land and their small charter plane to help them survive. Their time in the wilderness forces them through many difficult issues in their lives and asks some very hard questions of each of them. The story follows their race against death to make it somewhere where they can get help. But a month with only each other for company and danger constantly following them forges them into a friendship that few others would understand. Ben is an active doctor from Jacksonville who talks very frequently of his wife, Rachel, but won’t give voice to the problems they’re facing. Ashley is a journalist who is excited about the prospect of marriage, but not necessarily her groom. Both have a lot to wrestle with and the reader is allowed a little peek into their thoughts and turmoil as they make their way through the barren landscape in search of help. To be completely honest, I was a little disappointed by this book. Not because it was bad, don’t get me wrong! It was a good story, and Charles Martin is very adept at building and developing characters. That is probably his strongest suit in story-telling, and it is a good one to have! The story was well developed, and the characters are deep. But, I was still disappointed by a two things in particular. Let me address them point by point. The first thing that I was disappointed with was that while Martin still developed the characters well and had deep problems and emotion woven throughout, I felt that the nature of the book led to difficult conversations. When you have two people trapped together for a month with only each other for conversation things can get worn out quickly. The characters were still well developed, but I was disappointed with the dialogue at times. Perhaps the banter and sarcasm might have been realistic, but as a reader I got tired of the same jokes being made. That was the one literary thing that bothered me about the book. The other thing that bothered me was not so much literary, it was moral. I do not expect to agree with every author that I read, and I am not so close-minded as to reject everyone that does not agree with me on every point. However, that being said, I had previously really appreciated Martin’s morals and worldview in his books and in this book there were two subjects that were came up in which I was disappointed with the outcome. It is not because I expect Martin to agree with me on these points, but it is because they are highly debated and I have strong convictions on both. These two issues are abortion and lying. I was surprised that with the two topics, Martin does not include much dialogue or discussion about the morality of these issues, but simply makes statements and moves on. I was a little jolted in my mind at the brevity which he allotted these issues. It is not that I necessarily disagree with everything that Martin says in his book regarding these issues, I am just surprised that they were not drawn out anymore than they were. Those are my two critiques of the book, but overall it was an emotional and gripping story. I keep wanted to say that it is action-packed, but it isn’t really. I mean, they are stuck in the snow for a month! But it is an adventure story, and a story of the heart and journeys that the heart has to make. I would recommend this book, because we really did enjoy it and it does raise issues that are important to think through. But if I were choosing now, I would read it before his other books (namely When Crickets Cry and The Dead Don’t Dance (Awakening Series #1) ). Let me know if you pick it up! I’d love to hear your thoughts on it!! It is sometimes hard to write these reviews because I am tentative to share some of the best parts of the book because I don’t want to give ANYTHING away!! Have you read any books by Charles Martin? Which was your favorite? If not, what are you waiting for?